When the bulls and bears are locked in an intense and prolonged tussle with no one getting a clear edge, what do you do? When no clear direction emerges, many equity investors choose to go on a defensive mode. Can equities, that are known to carry higher risk than other investment avenues, be a defensive play? The answer is yes. If you go by the performance of stocks from sectors like the fast moving consumer goods (FMCG) and pharmaceuticals during the last couple of years, you may have noticed that during periods of extreme skepticism these stocks have lent you a cushion of safety compared to their sectoral counterparts. "FMCG, consumer durables, logistics and pharma companies are considered to be good defensive bets", says Rikesh Parikh, vice president, equities at Motilal Oswal Securities. Thus, from January 2008 to April 2009 (from the time the global financial crisis struck us and until the recovery) the Sensex lost 55% compared to a loss of -3% and - 17% in the FMCG and Healthcare index respectively. to be good defensive bets." 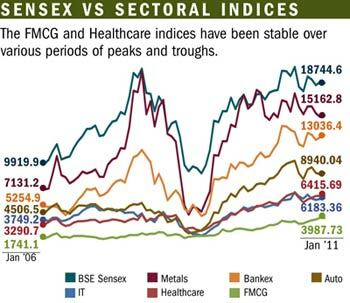 If you see the performance of various indices (see chart on sectoral performance), the FMCG and Healthcare indices have been relatively stable through various periods of peaks and troughs compared to the rest of the market. This is why stocks from these sectors are termed as defensives. "These stocks hold up in hard times because demand does not decrease as in other sectors", says Devang Mehta, head, equity sales retail, Anand Rathi Financial Services. Most companies in the defensive sectors are those whose businesses are not so much dependent on economic prosperity. Also, they have durable competitive advantage, pricing power along with less leverage, adds Mehta. A stock like Colgate, for instance, which caters to the oral hygiene segment, will not see its business affected during a downturn considering the usage in this category will still continue. You will still provide for your family's personal care need irrespective of the downturn. Auto companies, on the other hand, would be impacted in a rising interest rate scenario like at present or in an economic downturn considering people will postpone their car purchases. 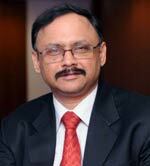 "The IT sector, to some extent, has become defensive to trade at lower valuations when there is meltdown of commodities, uncertainty of earnings in other major sectors", says Parikh. According to Parikh, interest rate sensitive sectors like auto, banking and real estate and infrastructure would be the absolute opposite of defensive sectors. In the last one year - during the period July 2010 to July 2011- in the rising interest rate scenario, the auto index returned only 6% compared to 23% delivered by the FMCG index. Similarly, cyclical and commodity stocks like metal, sugar, capital goods would be the opposite of defensives. The metal index, for instance, which delivered stupendous returns during the bull run from January 2006 until end-2007 (see chart) lost its lustre during the market fall of Jan 2008-April 2009, delivering a return of - 122%. The metal index is still languishing with a return of - 2% in the last one year (July 2008 to July 2009). The demand of metals is linked to economic growth, which has of late been rather subdued. Stocks are classified as defensives based on parameters like the beta (which is a measure of the stock-price change compared to the overall stock market change) of a stock, the return on equity (ROE) and the dividend yield. Defensive stocks typically have a beta of less than 1. A beta of 1 means the stock price moves at the same rate as the overall market, whereas a beta of less than 1 would mean that the stock would move less than the market on the upside as well as the downside. "The stock's average ROE of the last five years should be higher than 25%", says Parikh. Further, the stock should have an attractive dividend yield (dividend yield is the current annual dividend divided by the stock price) and the company should have a history of steady dividend payments. A dividend yield of greater than 3-4% on a consistent basis would be a good measure. For mutual funds, dividend yielding funds are categorised as defensive funds due to the underlying investment they make. Most funds in this category have exposure to energy, technology and FMCG companies, which have a low beta and offer a relatively higher dividend yield compared to the market. Stocks like ITC, which has a beta of 0.74, Infosys technology (0.84) or NTPC (0.72) are considered defensive stocks. Although these stocks create long term wealth at a lower risk, in a sustained bull run these stocks will underperform the market. When the market recovers it is the cyclical and high beta stocks that tend to outperform. Also, many stocks within this space may already be trading at their fair valuations, given the steady increase in their price. According to Parikh the best time to buy defensives is when there is a gloomy picture on earnings for manufacturing sectors, higher crude prices and higher interest rates. As the defensive sectors are less prone to the risks mentioned above they offer lot of value in uncertain times. So, if one is convinced that the market is going to remain bearish for a long period of time, one can go ahead and buy good quality defensive stocks with good ROE's, low debt-equity ratios and high dividend yields. "If an investor is 25 years of age and has a good job and has aggressive risk-taking abilities, he could probably have only 20-25% of his portfolio in defensive stocks", says Mehta. While an investor over 60 years of age and retired should ideally have more defensives in his overall portfolio allocation. So, choose your pick wisely. The spectre of slowdown in the global economy is becoming increasingly apparent. The moderation in the US, the Euro zone and in China's GDP growth rate has made this trend all the more evident. To add to that, the global markets may be increasingly susceptible to the sovereign debt crisis in Greece, whose debt of nearly Euro 10.9 billion approaches maturity in July-August month. To avoid a default, stringent but domestically grievous, budgetary cuts from the Greek government will be necessary. Indian policy makers, though sensitive to these global changes, remain acutely focused on developing a cogent policy response against obstinate inflation: hiking the repo rates again by 25 bps to 7.50% in mid-June. However, with the international crude oil prices moderating by -12.68% in last two months, the likelihood of inflation and interest rate cycle peaking sooner, rather than later, gains strength. There is further credence to this opinion since the possibility of a generic upward shifts in the interest rates in the US, Europe and Japan looks unlikely due to the global slowdown. In that context, RBI may too have to co-ordinate its policy actions with other central banks in the coming months. From the equities market point of view, the projected corporate earnings may continue to remain robust if the 19% growth Q1 of 2011-12 advance tax filings of the India Inc. is any indication. This is despite the domestic GDP growth estimates notching down to below 8%. Nonetheless, the domestic capital markets may remain circumspect in their approach and may need further cues to chart their future direction. The momentum in the equities market is largely sluggish because of tepid FII participation, though extreme volatility from time to time can be observed. The debt market witnessed a modest fall in the short-term yields because of a favorable demand-supply situation and a better than expected liquidity scenario. Moreover, the general impression that the interest rates may be near their peak, too has fused some optimism in the market. Broadly, markets should trade in a narrow band until the global uncertainties resolve and clarity emerges on the quality of the domestic earnings.